Brushing your teeth should be part of your daily routine. You know you need to do it twice a day for 2 minutes. Whilst there are benefits to an electric toothbrush, the good old manual brush is considered perfectly adequate, providing it is used correctly. Have you seen the number of options on shop shelves today? The choice is quite staggering. You might think, a toothbrush is a toothbrush right? They are all the same and they do not differ..Wrong, there are lots of subtle differences, that could make a big difference to your brushing experience. In this article we will let you know what those key differences are and what to look out for when picking a manual toothbrush. If you are going to spend 4 minutes brushing a day, you want to do it with a brush that you know is cleaning effectively and that you find comfortable to use. So what is the best manual toothbrush? Whilst there are subtle differences between brushes it is very difficult to pick 1 particular brush that is suitable for all. There will be a degree or trial and error involved for you to pick out what is your favourite or most liked toothbrush. To help you on that journey, here are 5 highly rated brushes that take into consideration all the key factors we see as important in the decision making process. We’ve included buying links, but be sure to shop around for the best price. Let us now explain in more detail about manual toothbrushes, how they work, what things to consider and why these brushes are considered to be amongst the best. At the start of this article we listed 5 different manual toothbrushes you should consider as part of your process to find the best manual toothbrush for you. Here are the 5 brushes we suggested and an explanation as to why each has been included. 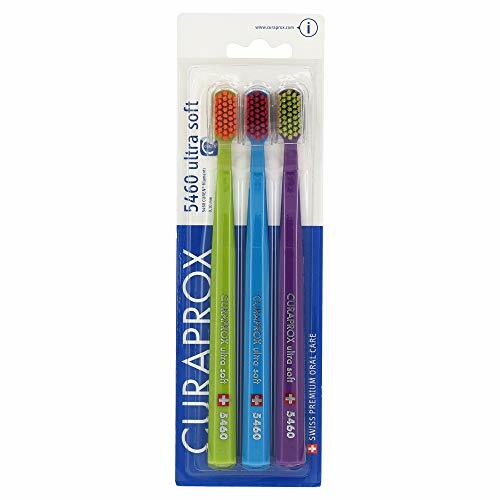 Available individually, these super soft bristled Curaprox toothbrushes work out great value when purchased in a pack of 3. If you are not familiar with Curaprox, the Swiss company have been working to perfect the oral health of people since 1972 and are one of the most recommended brands by dental hygienists. Each brush head contains 5,460 individual bristles that are just 0.1mm in thickness and together offer up an ultra soft brushing experience. Standard toothbrushes have 500-1000 bristles, so the increased number of bristles helps clean more effectively. A small and compact head makes it easy to move the brush around the mouth, including to the back teeth. The brush handle is actually octagonal in shape to help you position the brush in hand and in turn against the tooth and gum line. 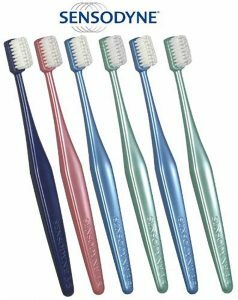 The handles are available in a variety of bold colours that offers a fun and colourful edge to these toothbrushes. Tight spaces are the easiest places for teeth plaque to build up and the toughest to clean. 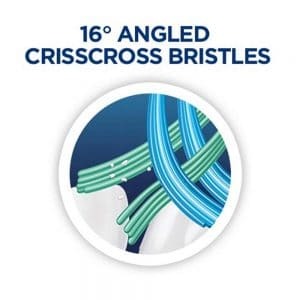 Straight-bristle toothbrushes often fail to reach within these gaps, but the Oral-B Pro-Expert All-Around Protection manual toothbrush is equipped with CrissCross bristles, oriented at 16 degrees that can attack the teeth and gums and penetrate in-between the teeth to remove more plaque. At the tip of the brush are what are referred to as power tip bristles, with more of a pointed shape to the head, these bristles are longer for better reach into those hard to reach areas of the mouth. Bristles have been polished to give the desires rounded tip to each one. On the edge of the brush head are soft ‘gum stimulators’ that massage the gums to help improve your oral health, whilst a textured tongue cleaner is found on the back of the brush head. 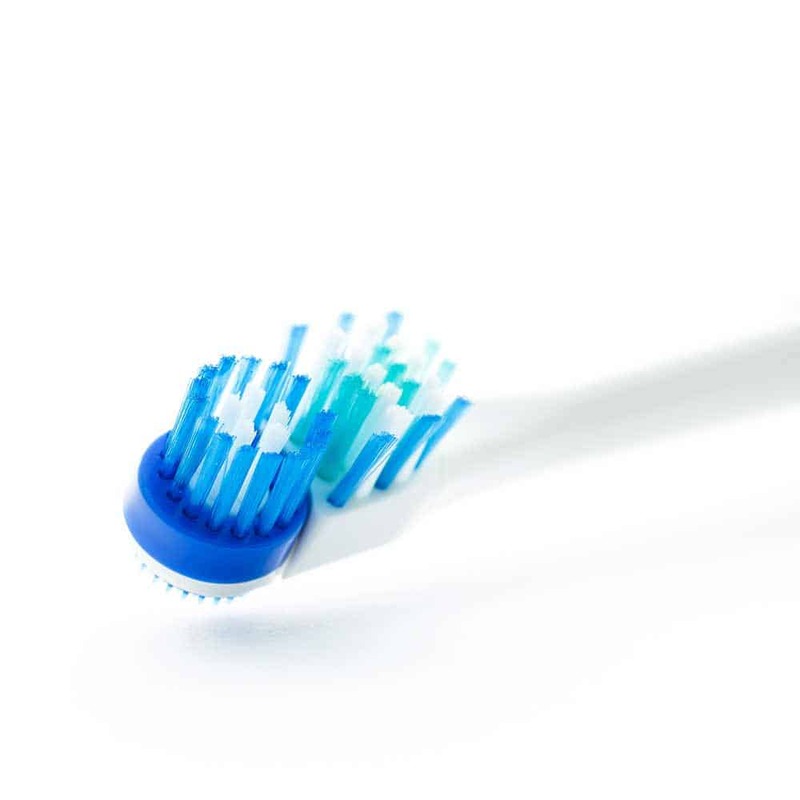 A manual toothbrush with soft thermoplastic elastomer bristles it offers the benefits of a manual toothbrush with the added bonus of being more environmentally friendly. With Boie USA you change just the brush head only. No need to throw the whole brush away. That brush head that needs disposing of can be recycled too. It cleans fairly well and is quite different in brushing experience to traditional nylon bristle brushes. Research suggests the effectiveness of such brushes are as good as regular manual brushes, but not all are convinced as of yet. Originally funded via a Kickstarter campaign, version 2.0 replaces the original and fixes some rigidity and design issues for a better experience. The handles and heads are available in different colours and can be purchased on a subscription basis. For a closer look see our Boie review. Like the Curaprox suggestion, this pack of 3 brushes from well known brand Colgate offers great cleaning performance and great value with 3 brushes sold in a single pack. The bristles on this brush are of a medium rating, so a little firmer, for those who want better plaque removal at the expensive of the softer brushing sensation. Slightly more diamond shaped in the bristle and tuft formation, the cleaning tip at the top of the brush head is specifically designed to reach into the tighter gaps of the mouth with the extra reach these bristles offer. The bristles has been rounded in the manufacturing process, to ensure they are soft and less damaging on your teeth and gums. The rubber grip on the handle allows you to comfortably hold the brush and not have it slip in use. This brush has achieved the ADA Seal of Acceptance which indicates that the toothbrush is both safe and efficient in the removal of plaque and reduction of gingivitis. 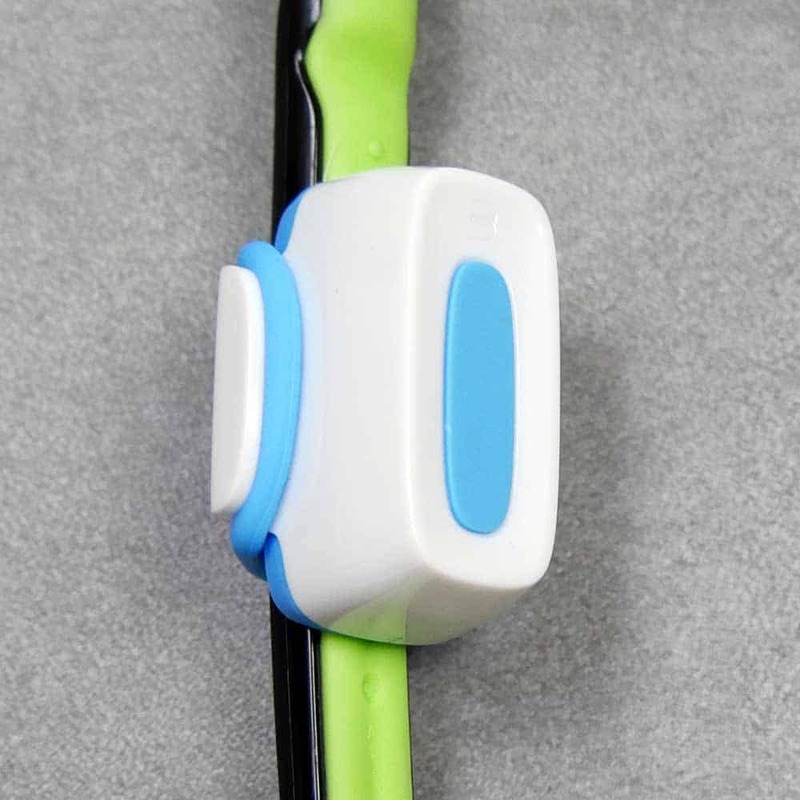 Toothbrushes like this with the ADA Seal have had data reviewed by the ADA Council on Scientific Affairs and have met the recommendations for toothbrushes. Sensodyne are well known for their range of toothpastes designed to specifically help those who suffer with sensitivity in their teeth. 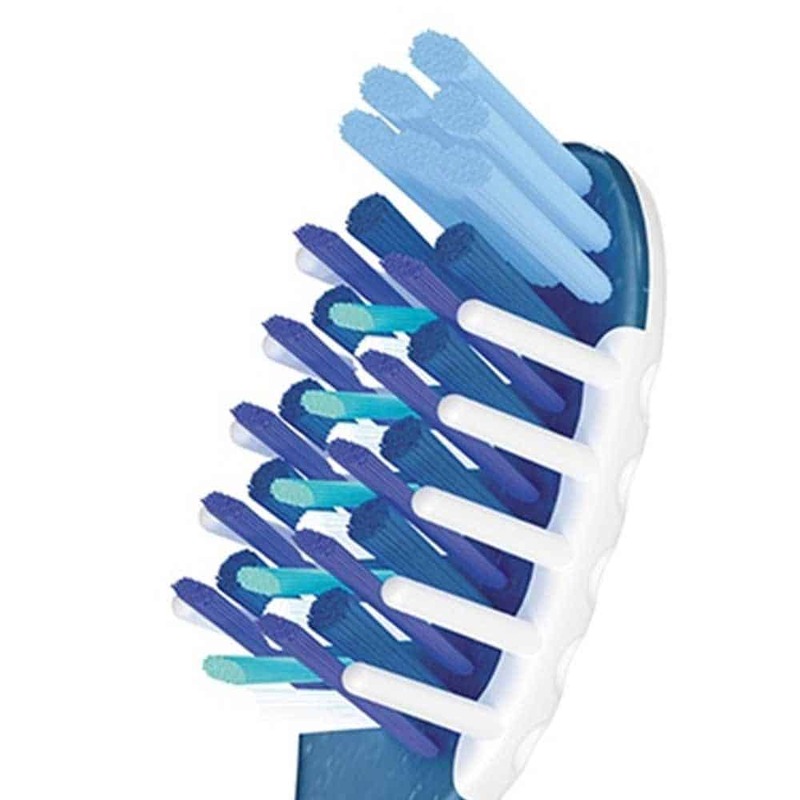 This brush from the company is a great accompaniment to existing Sensodyne users, but you do not need to have sensitive teeth to feel the benefits. The filaments (bristles) have been rounded to protect your teeth and gums and are of a medium firmness, not super soft as you might have expected. A fairly basic looking brush handle is broad for a good hold in hand but it slims at the neck, just before the brush head to aid with reach and in mouth positioning. Available for purchase as a single brush, great value can be achieved by bulk purchases. 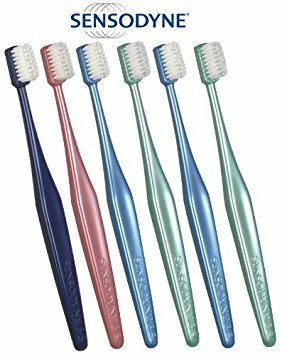 This 6 pack offers 6 individual brushes, in 4 different colours. There can be quite a significant difference in the size and shape of the brush heads on manual toothbrushes today. A stereotypical image might be a rounded rectangle configuration or bristles about 3-5cm long with all the bristles cut to the same length. Such brush heads do still exist and might be what you might consider the more conventional shape and size or a toothbrush head, but today there are smaller, rounder and even diamond shaped brush heads. The differing shapes and sizes are there to cater to the different needs of users. The same style might not work for all users. Some people prefer larger brush heads, whilst others prefer smaller. Some people have larger mouths than others with varying tooth sizes too, these contribute to what makes a suitable brush head shape and size. Generally speaking, dental professionals would advise smaller, round brush heads as their size often allows for a better reach and flexibility in positioning within the mouth. This can help with reaching teeth right at the back of the mouth which many fail to clean correctly. This difference in brush head size plays out in electric toothbrushes too. Oral-B tend to have small round brush heads, whilst Sonicare tend to be larger. Look closely and you will see the bristles on different toothbrushes are all very different. From the colour, to the way they are cut and the angles and orientation. Each manufacturer will have developed the brush head differently to try and achieve a great clean, but in some instances to achieve specific brushing results. Some brush heads may have bristles that help specifically with gum health, whilst others might be designed to help whiten the teeth and others may even be produced to clean deeper between teeth. Depending on your oral healthcare goals will depend to some extent on what you choose. There is to our knowledge no one type of bristle or cut that is remarkably better than another and most will give a good overall clean to the teeth, but some are better than others. Perhaps the most important consideration factor in your purchase is the stiffness of the bristles. You tend to get Soft, Medium or Hard (Firm) bristles on a brush head. Bristle firmness is to some degree personal preference, but evidence has shown that whilst medium bristle brushes are more effective at plaque removal, they are more abrasive to the gums to a level that is clinically significant. Therefore most dentists will advise using a soft bristle toothbrush as the likelihood of damage to the tooth enamel or your gums is less. Firm or hard bristled toothbrushes are not as easy to buy as they once were as a result of the evidence and dental advice given, even though they can remove more plaque. The potentially harmful nature of too-firm bristles is accelerated when users brush too hard. The extra (unnecessary) force applied when brushing along with the stiffer and more robust bristle can cut into and wear away the delicate gum tissues, doing lasting damage over time. Each brush head has hundreds of individual bristles in them. Made most often from DuPont Nylon, bristles are grouped together into ‘tufts’. A brush head will likely be made up by a number of tufts or varying shape, size and density. New technology and advances has meant that more recently, silicone and rubber bristled toothbrushes are now becoming more common with evidence suggesting they are as effective. The bristles on a brush head can be cut and shaped differently. Some brush heads have bristles all the same length whilst others are differing lengths. A brush head may have a wavy or criss-cross bristle formation whilst others may be more tapered in their design or even have a polishing cup design built into them. Evidence is somewhat lacking to clearly say what are ‘best’, but evidence does show that the tuft arrangement does play a role and that those with bristles of varying length and angle are better. The principle is that the varying lengths, angles and can reach different areas of the teeth and gums. Longer bristles are often at the top and bottom of the brush head, in an attempt to reach in between the teeth, with shorter bristles in the centre brushing the tooth surface. When a toothbrush is made the bristles get cut to the length of the manufacturers choosing. As they are cut by the sharp blade, they tips of the bristles are potentially uneven and sharp. As you brush, the sharper tips to the bristles can aggravate and abrade the teeth and gums more than those that have been through a blunting process. The blunting (or polishing) process is one where the tips of the bristles are rounded off to offer a softer and more enjoyable brushing experience. Seeing this rounded bristle tip with the human eye can be difficult and is best seen under a microscope. Some brands actively promote this rounding of the bristles as a feature of their brush and whilst by no means a guarantee, it is typically the cheaper brushes that do not go through this blunting process. The newer breed of silicone and rubber bristled brushes do vary in their cut and configuration. There seems not to be quite the variance as there is with nylon bristles, but given the smaller number of these types of bristled brushes, there is limited study into the ‘best’ configuration. 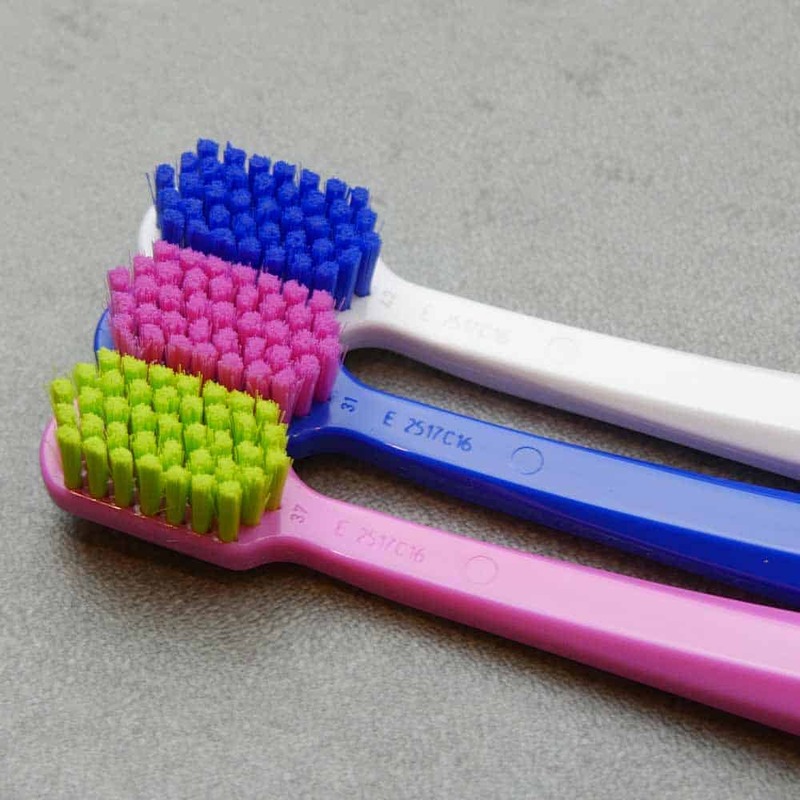 Commonly seen on electric toothbrush heads, some (but few) manual toothbrushes have bristles that have been dyed a particular colour and are known as indicator bristles. As the head is used the dye from those bristles fade out and act as a visual indicator to the remaining life of that head. Quite often they are a light blue colour, when the bristle fades to a pale almost White or opaque colour, it normally means you need to replace the brush head. Depending on the manufacturer, the design of the brush handle can vary quite considerably. Of course at the very core the handle acts as leverage for brushing and gives a length between the head for the human hand to hold onto and allow the brush to reach the back of the mouth with more ease. Flat/straight brush handles are typically the most basic design and cheapest to make. They are long flat handles with no contours, real shaping or grip built in. There are then those brush handles that are a little more shapely. Sometimes known as ‘contra angle’ brushes, towards the top of the brush handle, just before the brush head itself, the thickness and shape and angle differs. The handle becomes thinner normally to allow for better reach to areas of the mouth. More premium brushes then have one or more grips added to the handle or the whole handle itself is made from a much softer, less slippery material to ensure when in use you or I can hold onto it with more ease. Finally there are those brush handles that have been designed to really allow for much more flexibility and movement in the handle. The flex in the handle will absorb pressure and adapt better to different users brushing techniques and tooth formation. 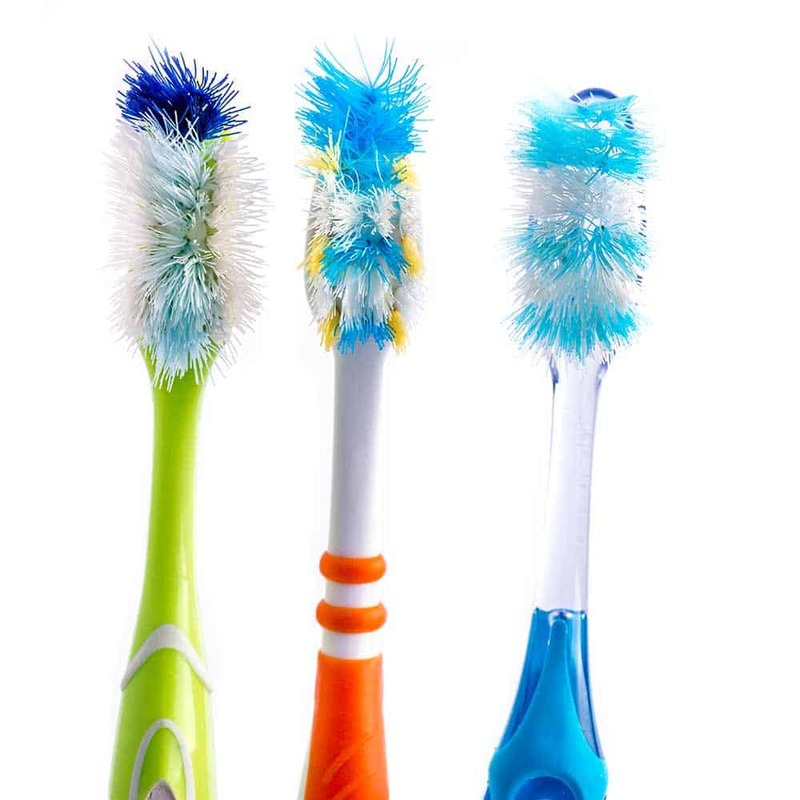 Typically manual toothbrushes unlike electric toothbrushes require the whole brush to be thrown away once it has been used. This poses environmental concerns, however, it is worth noting that there are now an increasing number of brushes that look to address this. This has an impact on the handle design, but brands like Boie USA have designed their manual toothbrush to have replaceable brush heads, so the handle is reusable. The price of a manual toothbrush can vary considerably. From less than a £1 through to £5+ per brush. The same brush will retail for considerably different prices in one shop to another. In many respects you get what you pay for, but it is not always that straight forward. Whilst we all like to get a deal and wish not to spend more than we need to, we would suggest spending £3-6 on a single toothbrush is normally worth doing. By spending a bit more, rather than just opting for the cheapest, you should be able to benefit from better quality bristles, design and cleaning performance. With manual toothbrushes you can often buy in bulk or get packs containing 4 or more brushes which can save you money and effort when it comes to replacing it next. 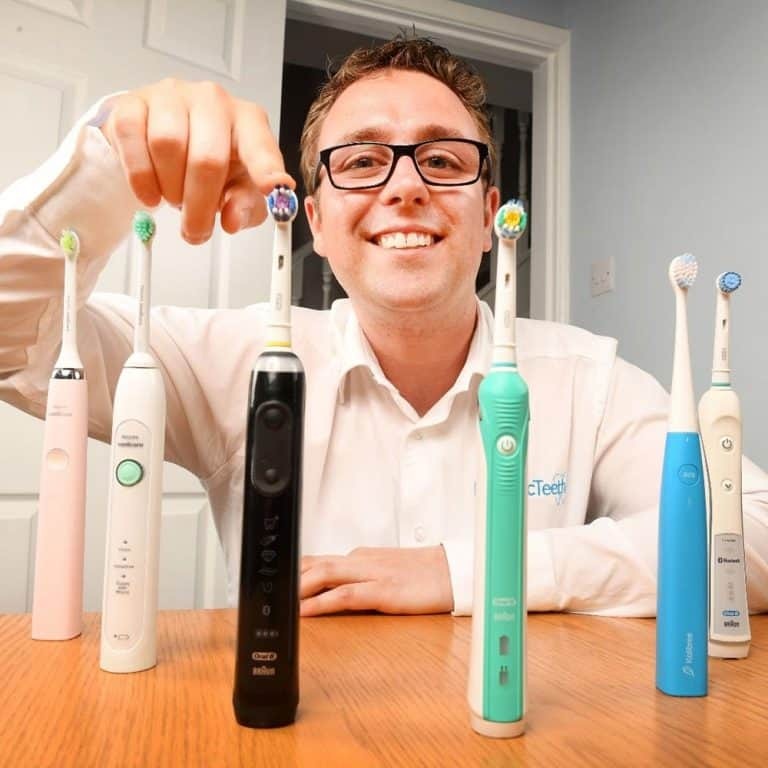 For the sake of comparison, electric toothbrush heads often cost £3-£7 from leading brands. Failing to use a toothbrush correctly is one of the biggest contributors to poor oral health. There is no one person or organisation to blame here, but many of us brush our teeth with the wrong approach. Did you know you should brush for 2 minutes and hold the brush at a 45 degree angle to the gum line? If you didn’t and to check you are using the correct technique. Read our guide on how to brush with a manual toothbrush, this will really help. For further assistance, why not consider investing in Brushlink? Brushlink is a super smart module that attaches to your toothbrush and via a smartphone app gives real time feedback on how well you are cleaning. It is like having a dentist there in the room with you. Check out our Brushlink review. Your dentist or hygienist will normally be more than happy to help and show you how to brush correctly too. Whether you know you have the right technique or not, a great thing to do is use plaque disclosing tablets every once in a while. Kids or adults alike, these are a fantastically interactive way to show you how well you are brushing. 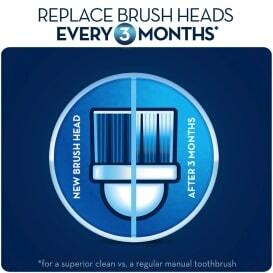 Professionals recommend on average that you replace the brush head of a manual toothbrush every 3 months. There are a few reasons behind this recommendation. The primary reason is that after roughly 3 months of use that brush will have spent best part of 360 minutes inside your mouth, passing over the teeth and gums. With every pass, the bristles built into the brush head are worn. After 3 months the bristles are no longer in optimum condition and could in fact be doing more harm than good. It varies from user to user, but often people brush too hard. Damaging on the teeth and gums it accelerates the wear on the bristles too. Often the can split and fray and look in bad shape when compared to a new head. By replacing the brush head this helps limit the potential damage that the bristles can do. Another factor that drives the 3 month replacement cycle is bacteria. There are over 600 different types of bacteria in the human mouth. Whilst a large proportion of this gets washed down the sink a proportion remains on the bristles of the toothbrush. Whilst organisations like the ADA have yet to see any credible evidence for significant risk being posed by this bacteria, they along with the NHS have recommendations on how to clean and store your toothbrush but realise that replacement of the brush head on a fairly regular cycle can help limit and potential issues. If you opt for the silicone or rubber bristle brushes, subject to the brand, these heads can last form 3-12 months. The material are more resistant to bacteria growth and with some silver particles are often built into the head and can help resist and kill bacteria that may reside in the head, thus making 3 month brush head replacement less necessary. Made often from plastic and nylon most manual toothbrushes are not recyclable nor good for the environment. They take hundreds of years to break down and are contributing to the plastic pollution problem we are experiencing globally. There is not necessarily a quick fix to this. It needs major brands to adopt change, but things are moving in the right direction and there are options out there for environmentally-considerate buyers. The primary downside to environmentally considerate brushes is that they tend not to offer the more desirable handle and bristle design of the plastic handled counterparts. Boie USA use recyclable plastic for their brush handles and heads, but the brush head is replaceable, meaning you need only replace the head and not the handle each time. Although the head requires replacement and needs to be ‘thrown away’ it can be recycled more easily than brushes that do not separate handle and head. Wooden toothbrushes, notably bamboo are designed to be thrown away every 3 months like a regular toothbrush, but being made of wood, the handle degrades a lot quicker as a natural product. How long and how often you should brush is a question that is frequently asked. 2 minutes, twice a day is the recommendation of the National Health Service (NHS) and the American Dental Association (ADA), by brushing your teeth for this long each day, you should be on the path to good oral health and reducing your chances of plaque buildup and well-documented health issues such as gum disease. In between teeth in everyone’s mouths are gaps. Some of these gaps are larger or smaller than others and may require different flossing tools. However irrespective of the size, you need to regularly (ideally daily) clean these gaps. Floss is best suited to small or tight gaps between the teeth, whereas interdental brushes are often preferred for the larger gaps, not to mention the added convenience they bring. Getting in the routine of flossing is important, but it is just as important to ensure you use the correct technique otherwise you are wasting time and failing to really deal with the source of the problem. There is no 1 best manual toothbrush. Varying handles, bristles stiffness, cut and even environmental issues play a part in the decision process. Of all the factors mentioned, in our opinion, the most important factors to consider are environmental footprint and bristles. Look to pick up a soft bristled toothbrush over and above anything else. The bristle cut and formation along with the price should be lower in your consideration and decision making process, but if you can opt for one of the more environmentally-friendly options as well, that is a bonus. Have you used any of the brushes suggested? Got a manual brush you use and love? Let us know your opinions and thoughts in the comments below.